Back in the day, there was a game about a blue hedgehog with a penchant for dodgy sportswear and who had a bit of a bling fetish going on. It took the world by storm, turned a generation of non-gamers into gamers, and helped coin the oft-mimicked “Do me a favour; plug me into a SEGA” catchphrase. For those of us who were already immersed in the world of gaming on computers, rather than consoles, that little blue guy was something we’d see by pressing our noses up against the windows of others. Many scoffed that it was inferior to the likes of Magic Pockets, Shadow Of The Beast, and Lemmings, to name but a few, but there was those – myself included – who longed for something similar to hit the computer-gaming market. Not long after, fans of the iconic Eric W Schwartz were to discover that the young animator was working with Amiga legends Team17 on a Sonic-esque platformer. That game would be known as Superfrog. It wasn’t as frenetic as Sonic, and neither was it as exciting, but it was ‘ours’, and it had an animation created by the guy responsible for Amy The Squirrel so, right away, that slimy green guy was taken under the wing of Amiga enthusiasts the world over. The heavy internal marketing for Lucozade may have been questionable, but it was easily overlooked as we bounced and raced through level upon level, smashing down walls into hidden areas and head-butting coins from out of nowhere. Good times. Great times. The first thing you notice is that, while they’ve gone with an entirely-new opening intro animation that’s nothing more than a slideshow, the story behind it remains the same – a Prince and his bride-to-be are out for a stroll in the leafy part of the kingdom when a bitter old witch spies their happiness and decides that she needs to put a stop to it. Next thing you know, the soon-to-be-Princess is whisked away and the Prince is turned into a frog. 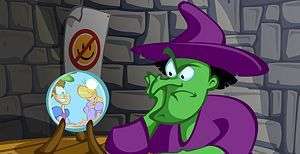 Luckily, the frog finds a magic potion floating down the river, drinks it, and is given the power to… well, he’s actually only given the power to go after his girlfriend, but he now wears a cloak. So begins your quest to rescue your beloved from the clutches of the evil queen by making your way through the lands to her stronghold, collecting coins as you go. Each level is timed, with no mini-map available, so there’s no way to know whether you’re heading in the correct direction but if you don’t reach the exit in time then your choice is between restarting the entire level or being thrown back to the menu screen. As you slip and slide around the landscape, you’ll have various pickups to help you along the way: the Lucozade bottles have been replaced with orange potions to grant a health boost while blue potions bestow a time-limited invulnerability. At times, you’ll run over a speed boost, and many of these chained together will result in some pretty damned fast action, which will invariably come to a sudden end as you trigger a pick-up with a slow-down effect, sending straight back to your original speed which, to be honest, is fast enough but obviously means that you won’t have that advantage against the timer. If you’re lucky enough, you’ll find one of two very important power-ups early on in the level, and these will make everything so much simpler, and rewarding, than they would have been ordinarily. The first is a little pair of white wings which, when picked up, allow Superfrog to flap open his cloak mid-jump so that it acts as a parachute and offers a more controlled, slow descent. The other is ‘Spud’, a little green dude that our hero can fire out at will to kill any enemies within his path, but he can only be thrown out in a straight line either left or right, so killing anything that flies requires a bit of manipulation where you’d send him out, then jump into the air so that he travels along a different path as he returns to the safety of Superfrog. Lose all of your five ‘chances’ within any particular life, however, and you’re back to being basic old Superfrog and have to hope that you’ll find additional pick-ups. Trying to prevent you from reaching the exit are numerous bad guys, tailored to whichever level you’re on, as well as various obstacles. Truth be told, coming at it with an entirely fresh, and considerably more critical, pair of eyes… there’s no real difficulty curve in Superfrog HD. You begin at the start of the level and you make your way to the end, in a very open-world style where you can go in whichever direction you choose, landscape permitting, so there’s no real challenge involved per se. There’s never a point where you have to stop to consider your way forward and plan everything in advance like you would in other platformers and yet, surprisingly enough, it’s not that really a big deal as the journey itself is enough. Getting to the end of a level and realising that you’ve only picked up two stars because you weren’t quick enough, or you’ve only discovered ten out of the fifteen hidden areas, or even that you’ve missed ONE bloody coin… these are enough to make you want to play through the level again. 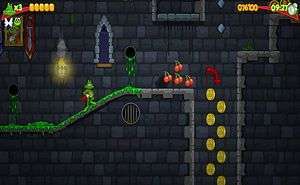 For those who long for a chance to play through all the original levels, a fruit-machine-styled mini-game appears at the end of each completed area, giving you three chances to win. It’s nothing complicated – a single button to control the reels – but after each spin there’s a chance to use up to three nudges to help pull up a winning line, with the text ‘left mouse click to nudge reel’, but this never worked for me until I had almost completed the game when, by accident, I stopped frantically clicking on the reels themselves and instead clicked on the ‘Spin’ button, which triggered the nudge. Poor instructions and bad design, in my opinion. Pick up a winning line, however, and you’ve unlocked one of the original levels to play through at your leisure. From beginning to end, it’s a bit of a romp; a nostalgia trip with a little aftertaste of sadness, knowing that, were it released today for the first time, it wouldn’t stand up against the others in its class. Ultimately, though, it’s a remake. It’s a damned faithful remake that doesn’t ruin anything you may have loved about the original but, and it pains me to say it, it could actually have benefitted from having had better level design to introduce more of a challenge. On first release in 1993, Superfrog was a solid platformer that earned respect in the industry. 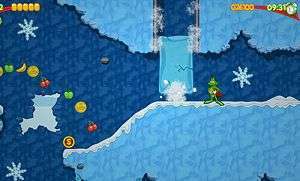 Superfrog HD, however, comes to us unchanged some twenty years later and is surrounded by ‘better’ games and this, sadly, makes it feel more like it’s aimed at the casual gamer rather than taking its rightful place. 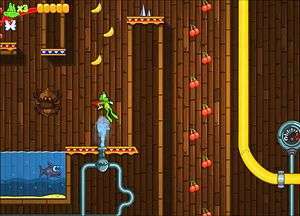 Superfrog was, and still is, one of those games where you can kick back for five minutes or five hours and just have fun without worrying about remembering where things are, important duties that have to be performed or any of the other baggage that comes with other games. It's very colourful, fast-paced at times, and having three criteria to meet (coins, timer and secret areas) means that it has a definite 'one more try' appeal. Were it being judged solely as a remake and not as a standalone game, it's easily a 10/10 game as it's perfectly executed. Where it lets itself down, however, is by being an exact remake. By today's standards, it needs more of a challenge, more consequence, and better level design to make it more appealing as a standalone to anyone beyond a Team17 nostalgist. Ultimately, as much as it pains me to admit it, a review should be scored on overall gameplay rather than how accurate the remake is. Sadly. Important note: I AM one of the aforementioned nostalgists, and love Superfrog HD to the point where I went on to buy another copy for the PS Vita so I could take it out with me. Those who loved the original will undoubtedly love it. Those unfamiliar with it, however, may feel differently.